Climate change? Bad. Wind farms to fight climate change? Maybe...also bad? That’s the weirdly veiled and instantly controversial conclusion of two new papers out on Thursday in Joule and Environmental Research Letters. The twin papers look at how wind power could create localized warming and how much energy wind farms produce. The results show that wind farms generate comparatively low power for the area they take up, and that installing a bunch of wind farms could heat up the surrounding land. The papers don’t say wind energy is therefore bad, but it’s hard to not feel that hanging over the proceedings or becoming a takeaway for bad faith actors looking to kneecap renewable power. And while it’s certainly worth weighing the results as we push toward a no carbon future, it’s also important to keep an eye on the reality that global climate change is likely much more of a catastrophe waiting to happen than local warming from wind farms. Lee Miller, a postdoctoral researcher at Harvard who led the study, told Earther he started exploring the topic because he’s very concerned about climate change. But he wanted to explore the climate impacts of renewables, particularly wind power. Previous research has documented the local warming effect of wind owing to how twirling turbines mix the atmosphere. The new study spins out an analysis into the future if the U.S. maxes out its wind power potential to meet all electricity demands. Right now, we get about six percent of our energy from wind power. The researchers ran a model that covered the Midwest—the wind energy heartland of the U.S.—with wall-to-wall wind farms and then modeled how the climate changed based on what we know about wind turbine dynamics. 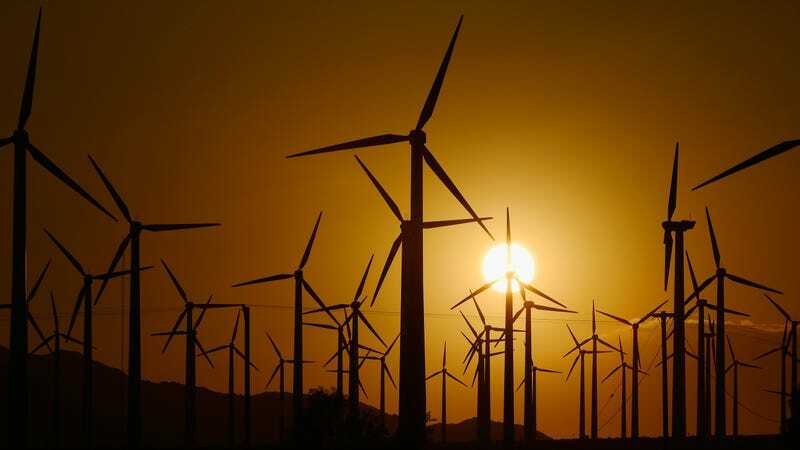 They found that as a result of these wind farms, the continental U.S. would warm about four-tenths of a degree Fahrenheit (0.24 degrees Celsius) by century’s end. Summer nights would warm the most because the turbines would basically stir warmer air that stays aloft down toward the ground. Based on their modeling, there would also be hot spots in the Midwest that would warm up to 1.8 degrees Fahrenheit (1 degree Celsius). That’s about what the planet as a whole has warmed since the start of the Industrial Revolution owing to carbon pollution. So, that local warming sounds pretty terrible given what we’ve seen from climate change’s impact on snowpack, wildfires, and heat waves. But here’s the thing: The world is on track to warm more than 8 degrees Fahrenheit (4.9 degrees Celsius) if we continue ramping up emissions. Even cutting emissions rapidly by mid-century will still produce an order of magnitude more warming than wind farms. The second paper deals with power density of wind farms. Obviously, we want to wring as much power as we can out of the wind. Efficiency is key to making sure we can deploy as many non-carbon energy sources to stave off the impacts of climate change. The new study shows that wind farms generate about 0.5 watts of energy for every square meter of land. The results are drastically lower than other estimates, including one used by the Department of Energy to map out the future of wind power in the U.S. They also inform the warming study, which as a consequence of this low power density used much more land to generate energy, thus magnifying the warming. The results of both these papers are dramatic, and Miller told me he felt like many angry journalists were calling him and that he is “being portrayed as not a nice guy” (for the record, he was very nice and answered all my questions). But the bigger issue is that the studies might be flawed. “This is by no means what future wind power in the US will ever look like. It is an interesting theoretical exercise at best,” she told Earther. “Even if we were interested in what this crazy scenario would do to air temperature, there are still problems with the tools that they used.” Those tools include the model used to project wind farm’s warming influence. There’s also the curious case of David Keith, a Harvard researcher and Miller’s advisor. Keith is an advisor for Carbon Engineering, a firm that is developing technology to sequester carbon from the air and turns it into fuel. The study results would seem to indicate this type of research is something we should be investing more time and money in. While that could be seen as setting up a potential conflict, Keith said it was “precisely the opposite” in response to questions from Earther. All this is to say that this is an important if somewhat speculative area of research. The last thing we want is for today’s solution to become tomorrow’s problem. At the same time, the studies could be construed as whataboutism and are likely to be picked up by climate deniers for just that purpose. Miller was sanguine when I asked him if that concerned him. “I try to really worry about things that I can control,” he said.